UPDATE – Winning Wednesday will be kept open for entries until midnight tonight (Thursday) Yesterday I commented on the author Margaret Feinberg Facebook Fan page – last night she commented back and said that she will put a link on her page for any of her readers to see it and enter. A woman living a modern life. A Bible full of ancient truths. Join critically acclaimed author Margaret Feinberg as she invites readers on the spiritual adventure of a lifetime. In her quest to better understand what God wants to communicate through the Bible, Feinberg explores the symbols and metaphors within the stories. To discover these deeper meanings, she spends time with a shepherdess in Oregon, walks the fields with a farmer in Nebraska, explore a vineyard of California, and talks with a veteran beekeeper in Colorado. Along the way, she gains deeper insight about how scripture applies to life today and discovers answers to puzzling questions. Do sheep really know their shepherd’s voice? How often does a grapevine need to be pruned? What does it mean for a land to be described as overflowing with honey? 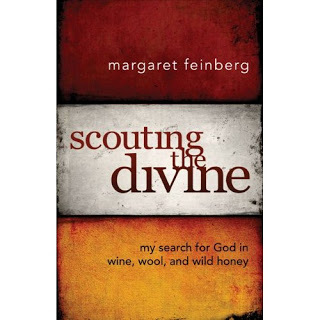 In Scouting the Divine, Margaret Feinberg connects two worlds – the writings from centuries ago with current day activities. She travels across the country and spends time with a grape grower, a shepherdess, a beekeeper, and a farmer. She joins their world for a day or two, getting dirty and muddy (and I don’t think it was all just mud) while hearing fresh insights about familiar Scriptures. She’s impressed as she realizes that God didn’t just give us abstract ideas to read, but he gave us real examples of the way nature works, and stories about the way life is. One interesting thing I took away is that while both hard work and rest are required to grow and produce wine, wool and honey, there’s more than one way to do most things. So one person might have one beehive and another one a thousand beehives – it they are diligent in their work, both will get honey. Its a good reminder that each individual and/or church’s journey with God will not be exactly the same – and that’s okay. I enjoyed the stories and the insight in the book. When I ordered the book, she was offering a 2 for 1 special and I’m glad she was. I liked the book and want to keep a copy, plus I want to share a copy with you. Please leave your name in the comments section below – I will select and post a winner on Friday morning. Anytime I can combine divine and wine, I'm in! I have just started a bible study of Margaret's called Organic God. I am loving it. I have been a little "dry" lately and I am really enjoying this study. It is neat to think of the Bible and God as all that and nothing more. Thank you for also sharing Margaret with more people. I would love to receive the extra copy of the book. This book sounds really interesting, I like the style of Margaret, so I'm in! I had a chance to hear Margaret Feinberg at a MOPS Summit and I have been a fan of hers ever since. Love her perspective on things! Thanks for the chance to win! This sounds like a book that would "eat my lunch" as my Texan friend said when something made her deal with life issues. Margaret's writing touches me–thanks for the drawing! I love Margaret Feinberg…please enter me in your drawing too! I am intrigued … I think we have much to learn & Margaret’s travels & insights seem to be a voice to lean into. I like the idea of celebrating diversity of how we do things – it is so easy to fall prey to comparison & looking for the ‘right way’ to create, work & play. Please enter me in your drawing. Margaret Feinberg is so cool! My name is Carrie Fitz. This is great, I have had this book on my wish list! I have really wanted this book! Would love this, thanks! I really enjoy Margaret Feinberg's writing. Pick me! I would love to read her new book. Thanks for sharing your insight on Margaret's book. This is definitely something I would love to read. I'm reading The Organic God now. Can't wait to read this one next! Thank you all for entering! I like to make everyone happy, so would love to send you all a book. The winner is now posted. I'm entering!! (maybe this will be my week! 😉 You always post the most interesting books and this one looks like a great one!